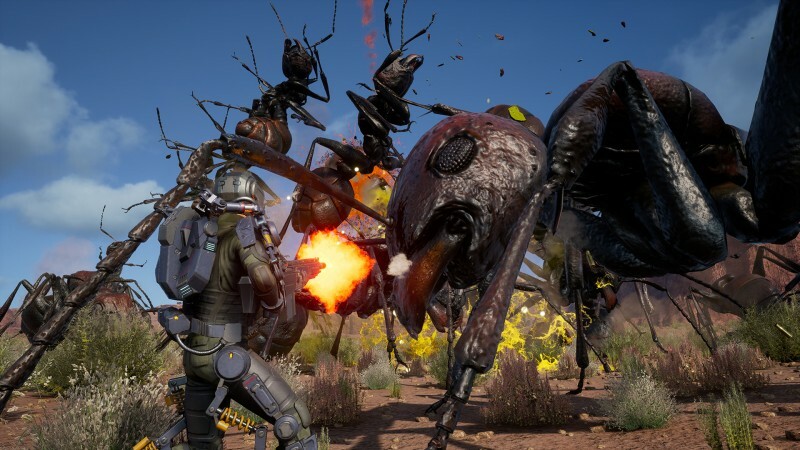 Few video games deliver B-grade camp as well as Earth Defense Force. In any given installment, you can expect to see giant ants scampering up skyscrapers to rain bile on anyone nearby, and skies filled with UFOs that deploy armies of robots, beetles, and even towering Godzilla-like beasts. Since the series’ inception, D3 Publisher has treated this goofy formula like an irreplaceable ancient scripture, hesitant to make sweeping changes between entries. As the years have gone by, the novelty of shooting a laser beam at a jumping spider wore off, and the series’ run-and-shoot gunplay stagnated to the point of feeling unintentionally retro. 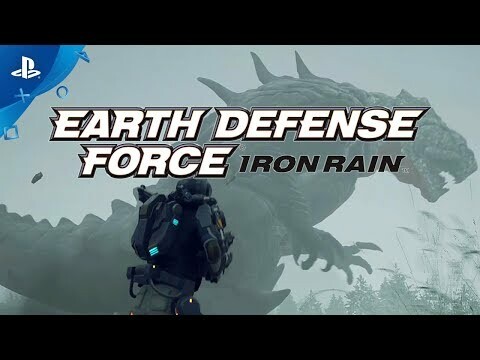 Earth Defense Force: Iron Rain was poised to be the entry that would take the series in new directions. 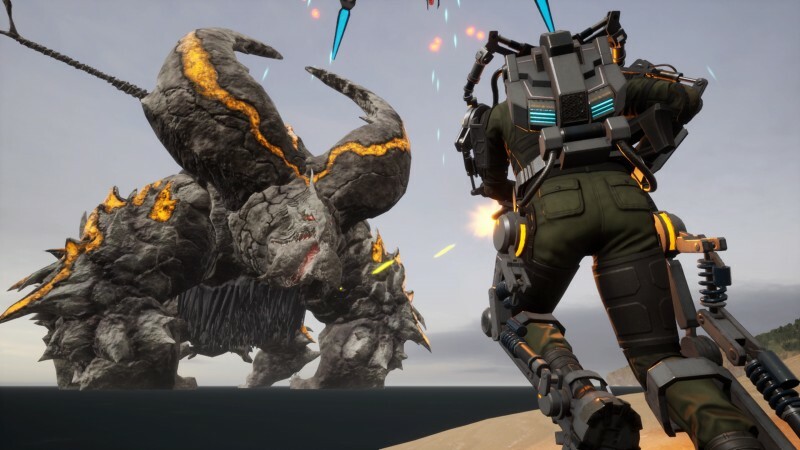 The development reins were passed from series creator Sandlot to Yuke’s to tell a story set decades after last December’s Earth Defense Force 5. From a story perspective, Iron Rain lives up to the billing, giving us a look at the evolution war against the “Aggressors.” Yuke’s humanizes this narrative through the voices of recurring characters that offer deeper insight into the EDF’s operations, as well as the world’s view of the invasion. While we get more story, don’t expect any mind-blowing (or even interesting) revelations. Everything said is of the “Blow them up” and “Is that a giant [insert insect type]?” variety. What the story succeeds in delivering are cheesy characters that are every bit as ridiculous and fun as the concept of insects coming from space. Even after decades of battling these enemies, the humans still act surprised whenever a ship appears over a city. I laughed at most of their banter, and legitimately looked forward to any time a character tried to rally the troops. If you can believe it, EDF’s formula is even more campy than before, and that’s a good thing. Changes also occur on the battlefield, but most of them are a slight step back for the series. Blowing away ants, scorpions, and anything that seems out of place in a city is still the order of the day, but these foes no longer drop loot. They instead leave behind gems in four different colors: green for health, and gold, blue, and red for crafting. When you finish a mission, you automatically unlock blueprints for weapons, vehicles, and cosmetic items. You then learn that constructing a low-end rocket launcher may only require 500 gold gems, but a nice laser rifle will set you back a hefty sum in red and blue gems. As much as I like having the random factor removed from EDF’s equation (since you know what weapons you can build and equip at any time), being handed 300 blue crystals at the end of a mission isn’t nearly as rewarding as gaining a new turret or missile launcher you can immediately use. Weapons deliver more attributes to weigh for your loadout. You can see the damage they deliver, ammo count, firing range, reload time, shots per second, blast radius, lock-on time, precision, recoil, and more. You can also pull these weapons into a practice session before entering a mission. You should do this, as some of the weapons function in unexpected ways, such as an assault rifle that fires a “lucky bullet” 1 out of 10 times, and a sniper rifle with ricochet effects. You may not want to use some of these weapons after the test, as reload times and functionality are all over the place. The new character class, the Prowl Rider, also disappoints. Being able shoot a grapple and zip up to a building top is great when it works, but doesn’t always latch onto objects or properly shoot up you to the desired surface. The Prowl Rider’s overdrive is also cool in concept – summoning a spider, ant, or scorpion to ride on and use as a weapon – but is difficult to control given how often these critters get stuck on geometry. Little touches like the increased hit-point capacity being applied to all four character classes are fantastic, and I adore how item weights are different for each classes. The standard Trooper can bring more fun toys to play with than the Jet Lifter, which is meant to be light for its flight and swift mobility. Having HP transfer means you can switch classes whenever you want, which helps you adapt to specific mission objectives and complement your co-op partner’s style of play. The running and gunning hasn’t changed much, feeling a little clunky in movement and dicey in targeting accuracy, but Yuke’s did a nice job of changing up the enemy formations between missions. New critters and dangers are introduced in a number of the 50-plus stages, and getting to battle on the top of a flying aircraft carrier (just like in The Avengers) is good fun, and a nice visual chance at the right time. The final boss is a pain that requires some grinding for HP and better gear, but is crazy in design and a worthy last adversary for a game built on ridiculous ideas. 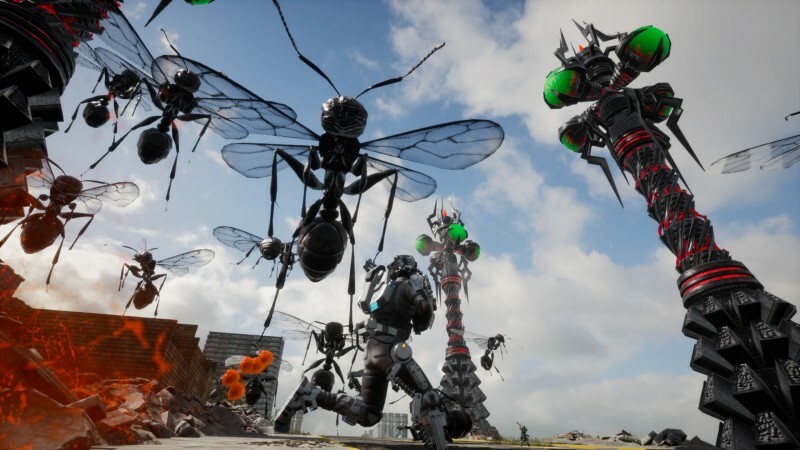 Earth Defense Force: Iron Rain is ultimately more of the same, just seen through a slightly different developer lens. Most of your time is still spent fending off waves of marching ants, which is still somewhat fun in an overly familiar way.